The first nucleus consisted in a chapel with several caves around, at a height of 791 m on the slopes of the Mount Subasio in a splendid ilex-wood. St. Francis and his disciples retired here for their prayers and meditations. In 1400 St. Bernardine of Siena erected a small convent and the church of S. Maria delle Carceri, which enlarged and incorporated the previous chapel. 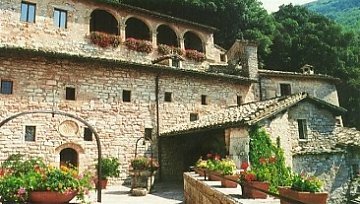 Next to it is located the Cave of St. Francis. You may take a suggestive walk through the ilex-wood along the caves of the hermits.